Over 16 days, the FONA trekking team followed the Great Himalayan Trail to circumnavigate the awe-inspiring Mount Manaslu, reaching the highest point of the trail, Larke Pass at 5,200m. Everyone stepped up to the challenge, which included a tough ascent and descent in snow! We passed through the epicentre of the 2015 earthquake and saw the scale of destruction – with whole villages swept away and evidence of many rock falls and landslides. Reconstruction efforts were evident – but much more needs to be done to help get locals out of makeshift housing and into proper housing and schools. At the end of the trek, we visited Sindhuli and were guests of honour at the school talent contest. The students shared their culture with music and dance, it was a great time of celebration. A huge thank you for supporting the trekkers and helping to make our regenerative vision for rural communities in Nepal a reality. We also extend our thanks to group of trekkers who gave 4 weeks to take part in the challenge and who gave their time to hold events to raise money for FONA. 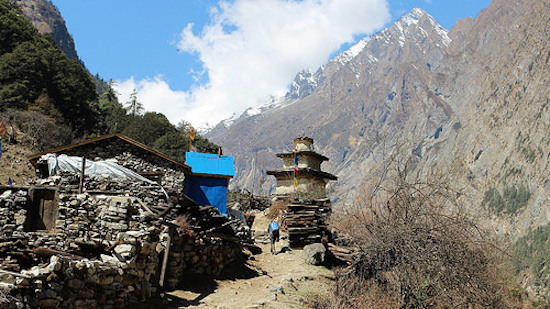 Hope to see you on the Nepal trails or a FONA event in future!